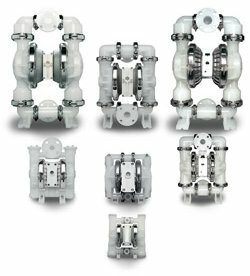 Wilden Pump & Engineering is a global leader in air-operated double diaphragm pump design and manufacturing. Wilden pumps are used in a variety of applications including water/wastewater, process, hygienic and energy. The company’s progressive diaphragm technology is one of the best in the world, incorporating a large selection of elastomers, including: thermoplastic elastomers (TPE), PTFE elastomers, rubber elastomers and more. Wilden’s Advanced Series air-operated double diaphragm pumps are built for optimal performance and efficiency. The pumps are used in a wide range of process and industrial applications including acids, pulp and paper, waste treatment, oil & gas and more. The Advanced Series AODD pumps are available in several elastomer options to meet fluid, temperate, and abrasion requirements. The pumps are available in ¼ inch through 3 inch sizes and can accommodate a max flow to 270 gpm and a solid size up to 3 inches. Wilden’s ORIGIONAL Series is a great option for mining, construction, waste water and process applications. 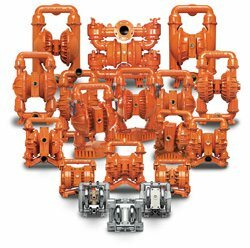 The pumps are available in ductile iron, stainless steel, PVDF, aluminum, and unpigmented polypropylene material options to handle a range of fluids. The ORIGIONAL Series is available in both portable and submersible configurations and has a lube-free operation. The AODD pump is available in ¼ to 4 inch discharge sizes and has a flow rate max to 310 gpm. The pump allows for a max suction lift to 31.2 feet wet, and 25 feet dry. The elastomers also allow for temperatures up to 177 degree F.
The company’s Saniflo series pumps are designed and manufactured for the sanitary process market, including food and beverage processing, bio-pharmaceutical, cosmetic applications and more. The product line includes stainless steel pumps made of FDA grade materials and fabricated high polish hygienic pumps. The AODD pumps offer various connections and surface finishes that are CIP (clean in place) or COP (clean out of place) for ease of use and maintenance. The Saniflo series has max flow to 243 gpm and max discharge pressure to 125 psi. The pumps also allow for 6 inch solids size. Wilden manufactures a line of high pressure pumps for well injection, food processing, water/wastewater, and pressure spraying applications. The company’s simplex and duplex diaphragm and piston pump technologies can deliver pressures to 3200 psig. The pumps can also handle up to 95 gpm of flow. Wilden Pump & Engineering is a global leader in air-operated double diaphragm pump (AODD) design and manufacturing. The company is located in Grand Terrace, California and is a part of the Pump Solutions Group (PSG). Wilden has more than 170,000 square feet of manufacturing facilities and a worldwide network of more than 180 distributors. Wilden pumps are found in a wide range of process, water/wastewater, energy, and hygienic industries.